With the rise of multi-core architecture, parallel programming is an increasingly important topic for software engineers and computer system designers. 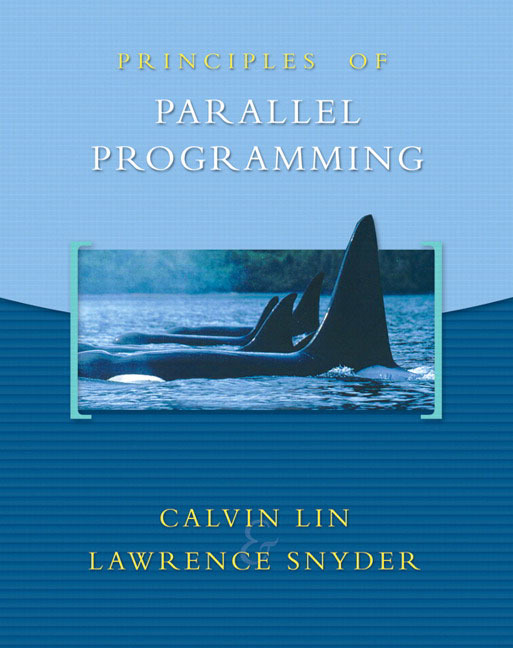 Written by well-known researchers Larry Snyder and Calvin Lin, this highly anticipated first edition emphasizes the principles underlying parallel computation, explains the various phenomena, and clarifies why these phenomena represent opportunities or barriers to successful parallel programming. Ideal for an advanced upper-level undergraduate course, Principles of Parallel Programming supplies enduring knowledge that will outlive the current hardware and software, aiming to inspire future researchers to build tomorrow’s solutions. A principles-first approach emphasizes the underlying concepts of parallel computation rather than taking a “how-to” approach for currently popular commercial tools. Popular programming languages are discussed in the context of these principles and the tools used for programming contemporary parallel machines. Historical Context and Historical Perspective features at the end of select chapters discuss important developments and/or research in computing history related to the chapter’s topics. Fact/Tip boxes provide interesting extensions of chapter information. Definitions boxes clearly define and isolate keywords from the main chapter narrative. Exercises at the end of each chapter offer opportunities to implement the concepts presented in the chapter. Appendix 1, More Advanced Concepts, expands upon the text’s topics to extend learning. Lawrence Snyder is Professor of Computer Science and Engineering at the University of Washington in Seattle. He received his PhD from Carnegie Mellon University and has devoted most of his career to parallel computation research, including architecture, algorithms and languages. With Calvin Lin and UW graduate students, he developed the ZPL parallel programming language. He is a fellow of the ACM and IEEE. He is an ardent traveler, enthusiastic theater-goer and occasional skier. Calvin Lin is an Associate Professor of Computer Sciences at The University of Texas at Austin, where he also serves as Director of the Turing Scholars Honors Program of undergraduate CS majors. He received his PhD from the University of Washington under the supervision of Lawrence Snyder. His current research interests include compilers and micro-architecture. In his spare time, he is an avid ultimate Frisbee player and coach of UT’s Men’s Ultimate Frisbee team.